➢ “Mr. 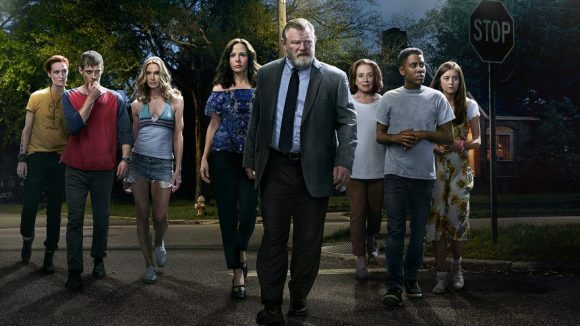 Mercedes is a fine example of Stephen King working in his frequent supernatural-free ‘Human darkness is the true horror’ mode … On the page, Mr. Mercedes is primarily a two-hander, a game of cat-and-mouse between initially suicidal retired detective Bill Hodges and increasingly homicidal tech guru and ice cream man Brady Hartsfield, but with David E. Kelley leading the writing team, the 10-episode series has expanded several supporting characters and reinforced thematic underpinnings.” — The Hollywood Reporter. ➢ “Mr. Mercedes begins with a monstrous act of mass murder. A warped soul wearing a clown mask mows down 16 people by driving a car through a crowd. Bones snap. Blood gushes. We get close-ups of people getting trampled. The carnage is sick, indulgent, and not surprising: This is a Stephen King creepshow, after all. But what sticks with you isn’t the horror, it’s the humanity.” — Entertainment Weekly. ➢ “This is an all-star crew operating at near the peak of their abilities. It makes for a tight, terrifying story of a retired cop and the madman who got away but won’t go away … Not only has King’s potboiler tone been faithfully adapted, it’s been expanded upon, turned into an exploration of class and the definition of masculinity.” — RogerEbert.com. ➢ “David E. Kelley has delivered another powerful adaptation on the heels of his Emmy-nominated Big Little Lies for HBO. In the first four episodes made available for preview, he does justice to Bill Hodges, one of King’s most colourfully compelling heroes in ages.” — TV Guide. ➢ “An assemblage of shopworn elements that does not offer much in the way of crisp pacing, character depth or originality. The hoped-for qualities that could be mined from King adaptations and injected with Kelley’s usual verve are largely absent, and the end result is repetitive and saturated with sallow superficiality.” — Variety.